Balboa Yacht Club hosts annual wooden vessel parade, silent auction and family fun for the weekend of June 8. NEWPORT BEACH — Balboa Yacht Club welcomes the 5th annual Newport Beach Wooden Boat Festival, June 8-10. 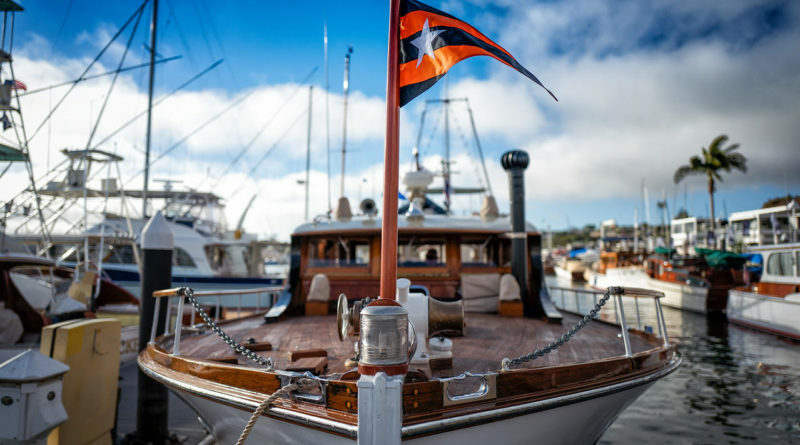 A popular event many yachting enthusiasts look forward to each year, admission to the show is free and will be a gathering of some of Southern California’s best vintage and new wooden boats. More than 50 classic show-ready wooden vessels will be displayed on land and in water, including one of the more recent SoCal Classic spotlights by The Log, Sea Boarder. Members of the Classic Yacht Association – who in the past have mentioned the desire to increase membership – are often in attendance at this show, which boasts a variety of wooden vessels with intriguing histories. Some may even be lucky enough to board these iconic boats at the show! A celebration for the entire family, there will be food vendors on site, live music by the bay including Dave Stephens’ Swing Band, a well-received ensemble that plays music inspired by the jazz of yesteryear, and exhibitors showcasing nautical arts and crafts among other fun-filled activities. Highlights of this year’s show include a silent auction with items benefiting Youth Sailing programs and cruises aboard Spirit of Dana Point, the 125-foot historic schooner. Water taxis will also be available to take patrons to Discovery’s Cube’s Ocean Quest at the Fun Zone. On the final day of the event, the Wooden Boat Parade will take place, which is a 90-minute event sailing around Newport Harbor. Watch some of the most stunning wooden boats in action setting sail around the harbor. During the last day of the show, the Heritage Sail-by will take place at 1 p.m. Participation extends to all wooden hull sailboats – no entry or registration required. For those who wish to enter his or her classic wooden boat, forms can be found online on the official website. Donations for the silent auction are also being sought and can also be granted on the website as well while browsing some of the items to be given away. This year, just a few of the silent auction prizes include baseball tickets to a Los Angeles Angels of Anaheim game, a golfing package to San Juan Hills Golf Club and custom pool cue and case by Games Plus Billiards. Free parking and shuttle available at Newport Beach Country Club. To catch the free shuttle, park at Corporate Plaza at 1600 Newport Center Drive. The entrance to the lot is the same entrance used to access Newport Beach Country Club. Shuttles will run all day from 9 a.m.-6 p.m. daily leaving approximately every 10 minutes from the parking structure. Newport Beach Wooden Boat Festival will take place at Balboa Yacht Club Marina, which is located in Corona del Mar at 1801 Bayside Drive. For more information about the event, call 949-673-3515 ext. 135 or visit newportbeachwoodenboatfestival.com.